ilospalooza 2017 expanded in grand style this Memorial Day weekend. 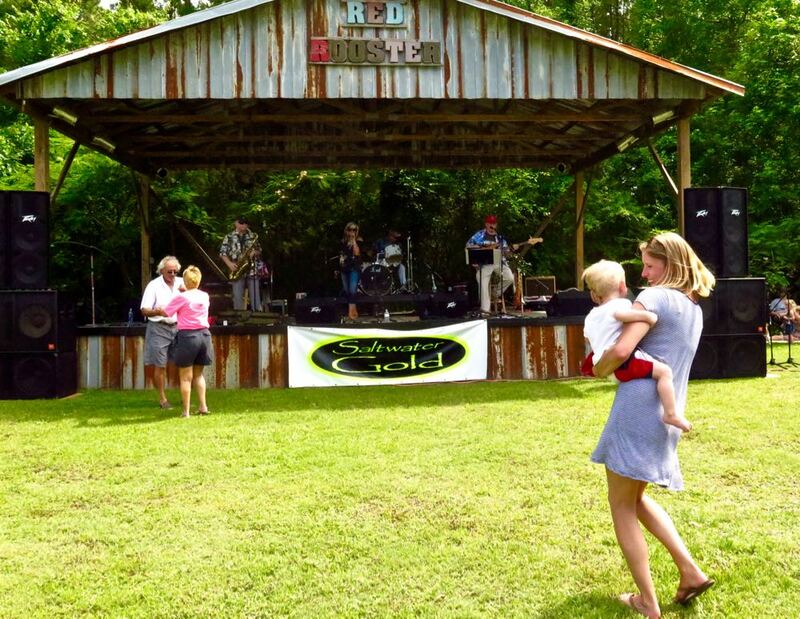 Now a nearly two-day event featuring overnight camping and breakfast on Sunday morning, the music festival at the Red Rooster drew crowds from beyond the county line. It also drew talent from very close by, as the choir from Pierce Chapel, the church visible across the farm field behind the Red Rooster, sang gospel Sunday afternoon. The dance floor/lawn got more crowded later on, but the dancing got started in mid afternoon as Jill and The Authentics played. Mac McWilliams plays for the day crowds on the Bantam stage. 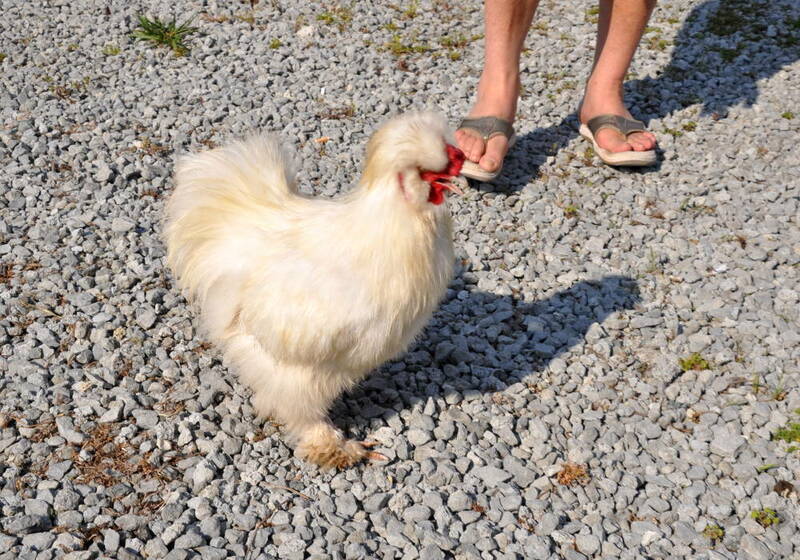 A couple hundred people, and a few dogs and chickens, moved through the venue throughout Saturday. 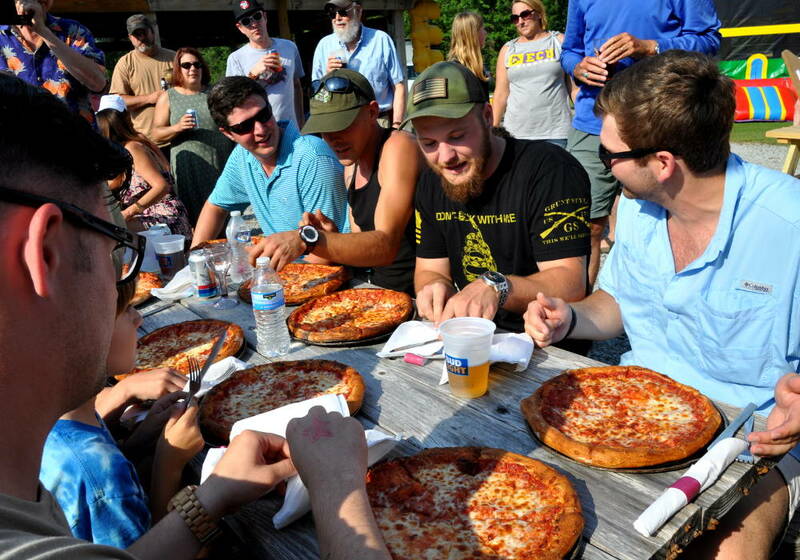 In addition to the eleven bands that played Saturday, there was also the pizza eating contest. It was a big draw – as many recorded the event as took part. The annual pizza eating contest welcomed all contenders with the caveat they be able to eat their pie with a fork. A colorful bounce house, provided for the younger set, greeted guests at the front gate. Kiddie pools were also set up to help the small ones beat the midday heat. Some of the furrier attendees preferred the pond – one dog tried – but failed – to catch a koi, apparently a more interesting quarry than the four resident fowl patrolling the grounds. As some guests left, more trickled in, with a full house well into the evening. Day became night and the bands played on. Much of it was music that spanned decades though some bands worked in songs they had written. Some attendees wore their fanciest attire for the occasion. 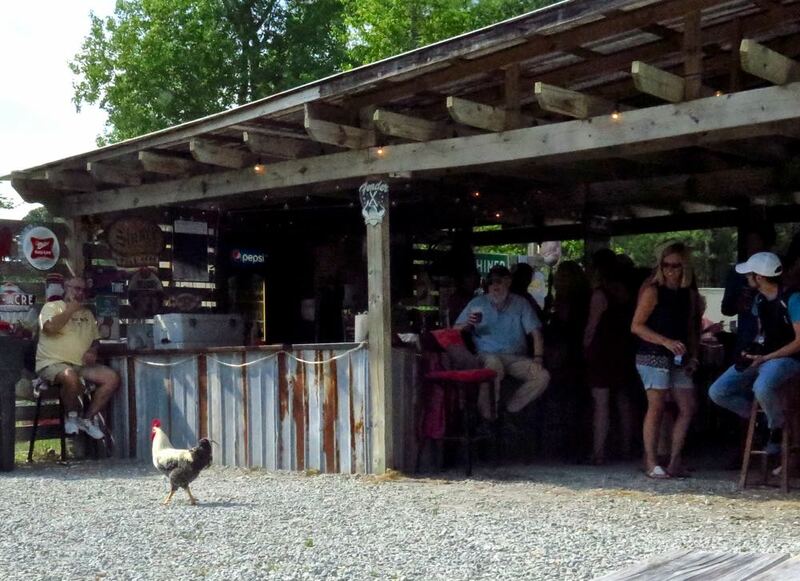 One of many rooster sightings Saturday. Drinks helped fill the dance floor well into the evening with moves both familiar and interpretive, but everyone on the grass dance floor had a smile on their face. Some even took to the tables in their enthusiasm for Saltwater Gold’s cover of “Ride Sally Ride”. When bands did take a brief hiatus from the stage, the crowds continued line dancing to the tunes house system, waiting for the next act to take the stage. 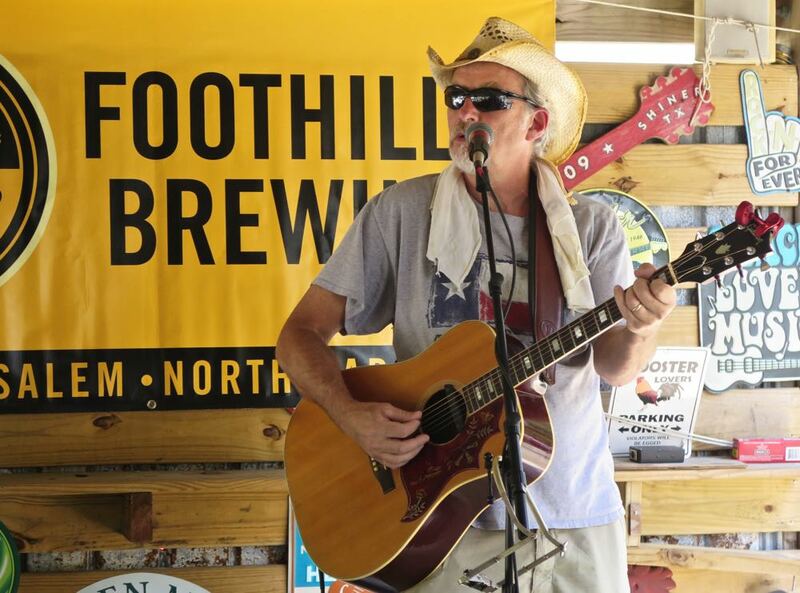 This year’s Silospalooza lineup included The Four Shots, Ken Belangia, Brant Island Strings, Mac McWilliams, Jill & The Authentics, Del Rios, Good Times, Mitch Hayes Trio, Saltwater Gold, Shedbelly, Bipolar Express. Sunday closed the festival with music from The Gospel Ensemble. 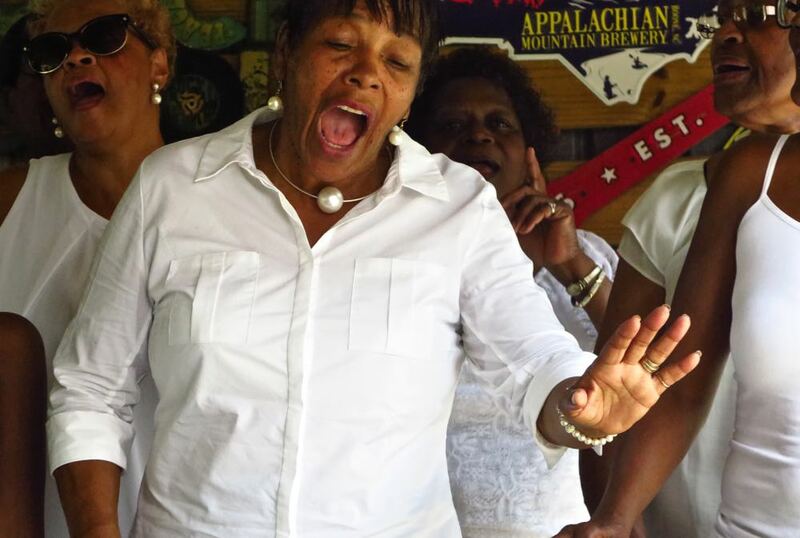 Sunday afternoon brought gospel singers to the Bantam stage. Though the start time was in doubt, their voices were not. There’s talk of making gospel on the small stage a more regular occurrence. TownDock.net willl have more on that as well as video from this 5th Annual Silospalooza. In the meantime, more photos.